The defeat of veteran democrats Albert Ho and Frederick Fung in the district council election raises uncertainty over pan-democrats' game plan for 'super-seat' polls in 2016 Legco election. 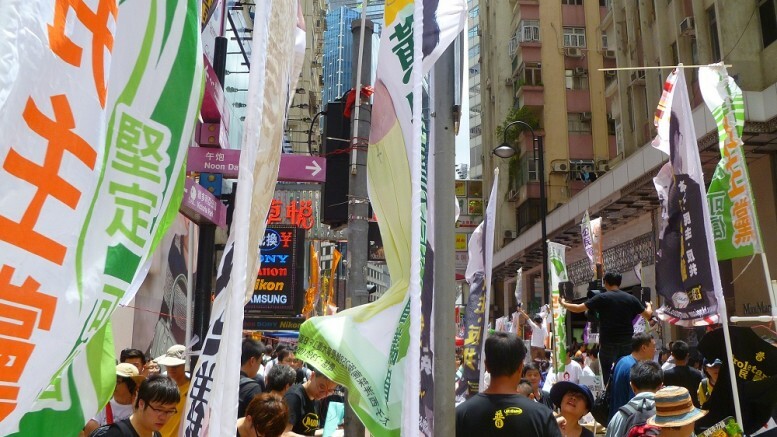 Since the 2003 District Council elections, the pro-democracy camp has been able to rely on its co-ordination mechanism to avoid clashes in constituencies, i.e., having two or more candidates in one constituency. The electoral system for District Council elections is one of single-seat constituency, simple majority. Despite competition and different views among pan-dem political groups, they accept the mechanism which has been functioning well. In the 2004 Legislative Council elections, an attempt was made to present a common list of candidates; but that was an exception. Legislative Council elections adopt a multi-seat constituency, single vote system. Pan-dem groups compete keenly for roughly the same group of voters. In contrast to the pro-Beijing united front, there is no way to allocate voters for candidates from different pan-dem groups. Take the example of the New Territories East and New Territories West constituencies in the 2012 Legislative Council elections, the pan-democracy camp roughly won the same level of votes in both, but it won four seats in NT West and six seats in NT East. Regarding the five Legislative Council seats for District Councils 2012, the pan-dem movement presented three candidates, secured about 55 per cent of the votes and won three seats. It naturally desires to repeat the same exercise in the Legislative Council elections next years. But the difficulty in 2016 is that there are no three obvious candidates. Frederick Fung and Albert Ho just lost their District Council seats, and Kenneth Chan Ka-lok of the Civic Party failed to win. Only James To can continue to compete. If the pro-democracy movement has six or seven candidates to campaign for the five Legislative Council seats for District Councils, it is likely that it may end up with two seats won. Some umbrella groups now have plan to compete for these Legislative Council seats mainly to secure recognition and establish their reputation. Some pro-democracy independent District Councillors like Paul Zimmerman are interested. Among the major pan-dem political parties, there are not a few who are attempted to give it a go. The NeoDemocrats with 15 District Council seats is now naturally qualified to complete. The direct advantage of holding a primary for the pro-democracy camp is the opportunity to show that it is reading to elect its candidates in a transparent, open manner. Those who are interested in a seat for the District Councils may take part in the primary to test their respective electoral appeals, without dividing thin the pro-democracy camp’s votes in the formal elections. Young candidates from the umbrella groups may also use the primary to establish their respective reputations and gain experience in large-scale election campaigning. Such a primary is not legally binding, but participants are naturally bound by their moral obligations through actual participants in an electoral contest widely reported by the media. Even for those candidates who refuse to take part in the primary, they know that it will be considerably more difficult for them to secure the votes of the pro-democracy camp’s supporters should they choose to run in the formal elections later. Simply put, if the pro-democracy camp decides to hold a primary for the five Legislative Council seats for District Councils to elect three candidates, the resistance should be small. Among the pro-democracy political parties, there is often competition for their respective parties’ nominations, and this keen competition often has an adverse impact on intra-party solidarity. A primary may help to solve this problem of intra-party competition. For the participation the primary, serving as one of the pro-democracy camp’s three candidates means a very strong chance of winning a prestigious Legislative Council seat returned by the territory-wide electorate. Even securing the fourth, fifth or sixth position demonstrates a strong electoral appeal, and should much enhance the candidates’ prospects of winning Legislative Council seats in the geographical constituencies. Hence the primary is worth the serious efforts of the participants. From the pro-democracy movement’s point of view, improving its image and establishing the mechanism is worthy of the resources spent on the primary. Allowing young candidates to take part and establishing a good image for the individuals concerned help to generate new blood for the movement. Such a mechanism is especially valuable in the critical juncture of inter-generational leadership changes. The primary election of the Chief Executive candidate from the pro-democracy camp for the 2012 election has already established precedent or even a model. The general formula may well be equal weight accorded to actual votes secured and results of public opinion surveys. Too many candidates may create technical challenges, resources are an issue., but they are certainly not insurmountable problems. Joseph Cheng Yuk-shek is former professor of politics at the City University of Hong Kong. Be the first to comment on "Pan-democrats urged to mull primaries for 2016 Legco poll"